Old Market Square in Nottingham is one of the oldest public squares in the UK with an 800 year history as a market place. At 11,500m2, it is the second largest in Britain after London’s Trafalgar Square. Its regeneration by Gustafson Porter + Bowman 2005-2007 involved the replacement of a design by T.C.Howitt, architect of the square and the adjacent Council House building. Both the square and building were completed in 1929, and the square was listed in 1994. In 2004, the City’s Development Department organised an international design competition. The brief was to; provide unhindered access for all, use high quality materials, provide new water features, introduce soft landscaping, integrate street furniture, create flexible performance space, allow people to linger, encourage 24 hour use, enable perimeter activity to spill out into the space, and attract pedestrians by virtue of its design. It also had to create a sense of place and reinforce the distinctive qualities and character of Nottingham. The new design incorporates the organic topography of the original medieval square, and accommodates existing falls by gradual level changes for wheelchair users and drainage. The predominant material is granite, to reflect the importance of the space and provide a long design life. 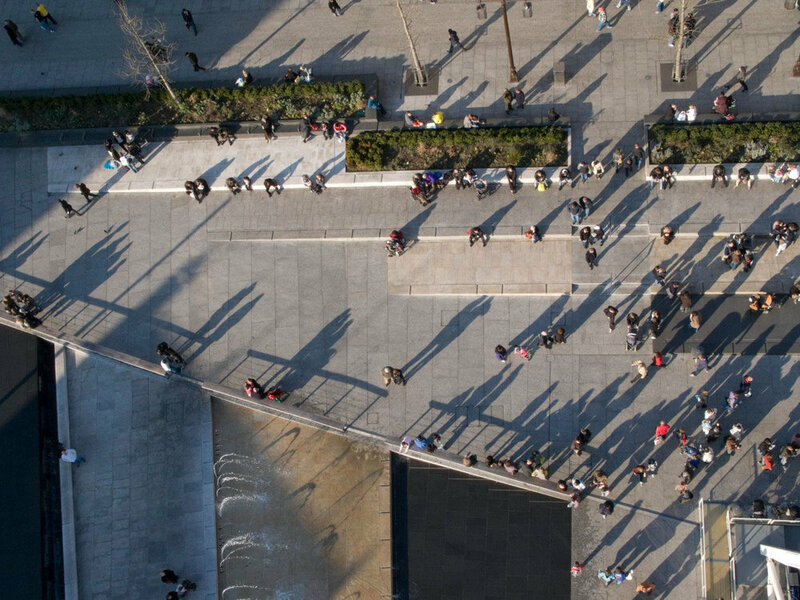 Many UK public squares are dominated by road traffic, signage and street furniture; however collaboration with city planners has resulted in a clutter free, contemporary design. The materials have been designed and selected to be sympathetic to their context and robust enough to stand the test of time. The central market square is composed of a large light coloured surface of slip resistant granite from Portugal that compliments the Portland stone of the Council House. It is accessible to vehicles for staging events, setting up markets and creating the backdrops required for a variety of performances. New terraces providing significantly more seating than before and are formed of grey, black, white and beige granite blocks. These colours reflect the range of stone used in the surrounding building facades and also delineate level changes. Their tapering forms create rows of benches, whilst others form planters. The project has been well received by the citizens of Nottingham and is well used both in attending events but also using the seating areas to relax and meet.